Thanks for taking the time to visit this site. Jim Manuel, the Jim in Jim’s Lake Land Taxidermy has been a full time professional taxidermist since 1981, specializing in North American and African mammals, birds and fish. He provides traditional fish, birds, shoulder, pedestal, full body and European mounts as well as habitat dioramas and custom one of a kind designs. What makes Jim’s Lake Land unique, other than Jim’s attention to detail and almost fanatical commitment to quality is that he is the ONLY person who will touch your trophy…no subcontractors, skinners, capers, apprentices or helpers of any kind will “assist” on your mount. 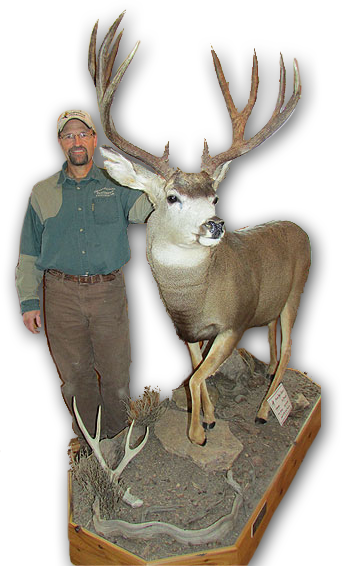 It’s a major point of difference that separates Jim’s Lake Land Taxidermy from other shops (especially large production operations) and it clearly shows in the creativity and quality of Jim’s finished pieces. Creativity, commitment to quality, attention to the smallest details, results in clean, relaxed, anatomically correct mounts that truly bring your outdoor memories back to life. If you’re looking for an experienced, creative professional who loves the out of doors, does his own work, listens to your requests, and strives for perfection…you’ve found your taxidermist.